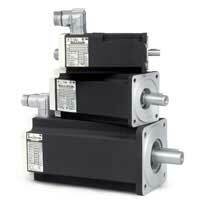 A servo motor refers to a rotary or linear actuator that includes both a motor and a feedback sensor for positioning. The type of motor will vary by application, with brushed DC motors for simpler applications due to their low cost and brushless AC motors for more complex, performance-centered purposes. Servo motors use an encoder for feedback on position and/or speed, which is then used to rotate the output shaft to the commanded position. Servo motors deliver precise control of position, velocity, and acceleration in the closed-loop systems of servomechanisms. Servo motors require a servo drive - this uses the feedback data to precisely control the position of the motors direction and rotation distance.